Back in 2010, when economic issues caused the City of Park Ridge to suspend its annual holiday lights program, groups of volunteers took up the task. By Christmas 2014, however, those efforts had waned to the point where both Uptown and South Park had lost their holiday charm. In Fall 2015, however, a small group of Park Ridge business owners and civic leaders formed a not-for-profit organization called the "Park Ridge Holiday Lights Fund." 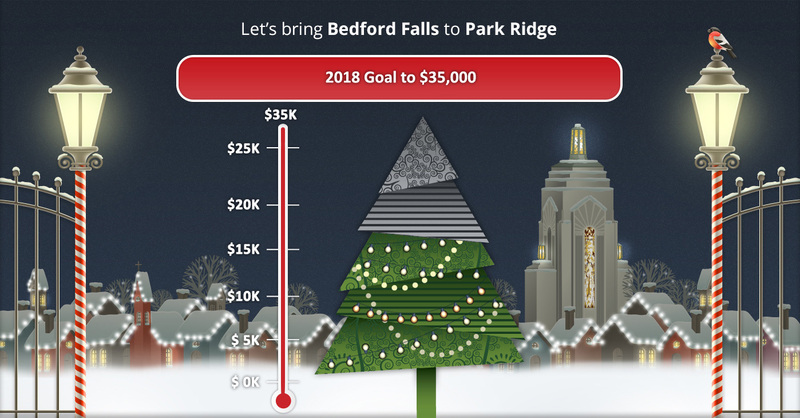 Its goal: Raise enough funds each year to pay for the purchase and professional installation of lights throughout both the Uptown and South Park business districts. And thanks to the generous donations from so many of you, our first three holiday seasons were a huge success as our beautiful City was aglow with thousands of lights. We are coming to you once again for your help – not just your money but also your enthusiasm and encouragement – in order to make holiday lights a reality for 2018, not just in the Uptown and South Park areas as in the past but also for the new streetscape on Northwest Hwy. east of Prospect. Will you help us to once again bring a little bit of “Bedford Falls” to our town this holiday season and, hopefully, for years to come? Park Ridge Holiday Lights Fund NFP is an Illinois not-for-profit corporation tax-exempt under Section 501(c)(3) of the Internal Revenue Code. Donations are tax-deductible under Internal Revenue Code Section 170 as allowed by law. Copyright © 2019 Park Ridge Lights. All Rights Reserved.